Africa is emerging as one of the biggest consumer markets in the world, and also the scramble for its resources is not an unknown fact. The African Union celebrated its fiftieth anniversary last week with fanfare. Besides South Africa other members of the BRICS grouping participated in the anniversary celebrations. Russia was represented by its envoy to Africa, Mikhail Margelov, India by its Vice President, Hamid Ansari, Brazil by its President, Dilma Rousseff and China was represented by its Vice Premier, Wang Yang. The South African Tourism Minister, Marthinus van Schalkwyk told an Indian newspaper on May 26 that the prospects of mutual trade between the BRICS countries are immense. He particularly referred to tourism and mentioned how tourism flow to South Africa from other four BRICS countries has grown exponentially in past few years. South Africa has already tourism offices in India and China, and its tourism department has revealed that the country will soon open tourism offices in Russia and Brazil and other countries. The minister further pointed out that the opening of the BRICS bank will not only aid the process of infrastructure development in Africa, but will also promote tourism. Besides tourism, the bank will also help promote the growth of mutual trade. At present the intra-BRICS trade stands at about $230 billion, which is expected to touch $500 within a span of about two years as the trade grows at 28 per cent annually. 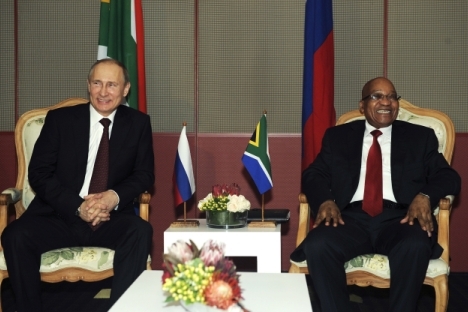 Few days back during his visit to Russia, the South African President, Jacob Zuma had emphasized that South Africa is a gateway to Africa. As the leading member of the African Union, and also as a member of the BRICS, South Africa can play a bridge building role in bringing Africa and the BRICS closer. The country has also assumed a crucial position in fostering infrastructure development in the whole continent. Africa is emerging as one of the biggest consumer markets in the world, and also the scramble for its resources is not an unknown fact. The continent is considered to have 60 per cent of world’s uncultivated arable land. The BRICS collaboration particularly in developing joint strategies in parallel with bilateral relations will not only provide the BRICS a special leverage in exploring African market and resources, but will also widen its reach in the continent. Dilma Rousseff’s step in writing off debt can be viewed as a strategy to enhance Brazil’s influence in the continent. Rousseff’s spokesman stated that “The idea of having Africa as a special relationship for Brazil is strategic for Brazil’s foreign policy.” Similarly, China’s investment in South Africa and other countries of the region have deepened its reach in the continent. During Zuma’s visit to Sochi to meet President Putin, both the countries signed eight crucial agreements in diverse areas ranging from energy, defense and science and technology. The establishment of BRICS bank will be a crucial addition to the BRICS prowess in Africa and beyond. Zuma has already argued that the most suitable location for the establishment of the bank is Africa. His argument has the following strings. Africa will be benefitted the most from the bank as it has to meet its infrastructure needs, to finance industrial growth and to fund small and medium scale enterprises. The location of the bank in Africa, hence, is an imperative. His argument may be considered by other members of the grouping. As the speculations get ripe that by the next summit the bank will have some concrete shape, perhaps the reality of the bank is not that far. South African tourism minister argued, “The setting up of a BRICS bank will be a great enabler to boost tourism among the nations. There exists an enormous potential among BRICS nations to promote tourism.” Even though the skeptics harp on the problem areas the bank idea now confronts, almost all agree that the BRICS bank will evolve as an alternate force in the world. Early this month Takehiko Nakao, the head of Asian Development Bank, a major development bank in South East Asian region, stated that “I had some talk with the ministers of those countries. Of course there is a huge infrastructure need in the region and within the world. So to mobilize money for those projects, it is nice to have another institution (BRICS bank).” The World Bank and IMF have already expressed interest to work with the bank. Without repeating the well-known facts about the BRICS growth story, it would be apt to emphasize that its influence is bound to grow in coming years. All the members have grown in various degrees in past few years despite global economic slowdown. Russia, India and China in Asia, South Africa in Africa, and Brazil in South America – the BRICS not only links the three continents membership wise, but also possesses enormous potential to widen its economic linkages to all these three continents and beyond. BRICS success story in Africa would lead the grouping to replicate it in other countries and continents. Perhaps after, or simultaneously along with, Africa BRICS members can work on ideas to widen their networks to Latin America with Brazil being the major anchor.